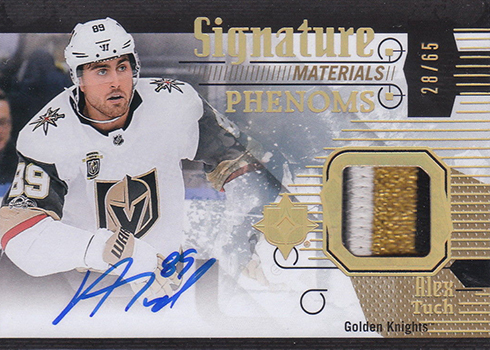 2017-18 Upper Deck Ultimate Collection Hockey brings the brand back for another round of high-end cards. 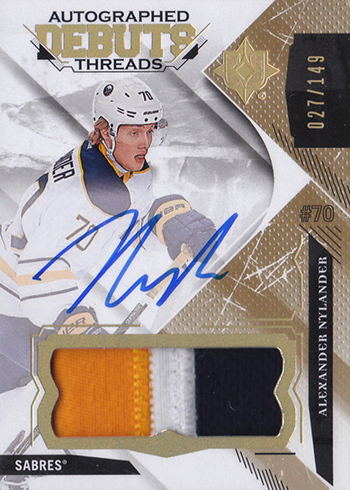 While each box has just four cards, three of them are in the form of autographs and memorabilia. 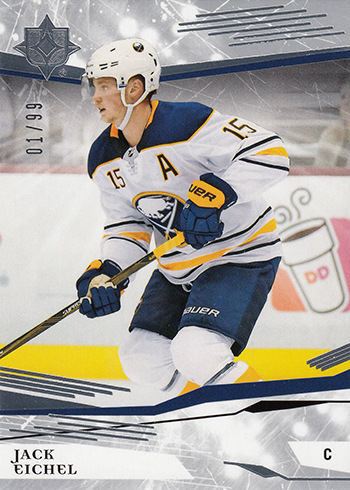 With just 99 numbered copies each, base cards aren’t in high supply. 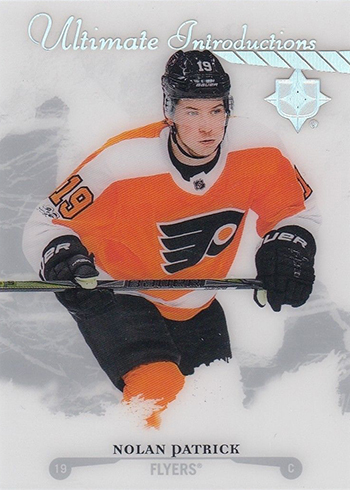 Onyx parallels come numbered to 10. 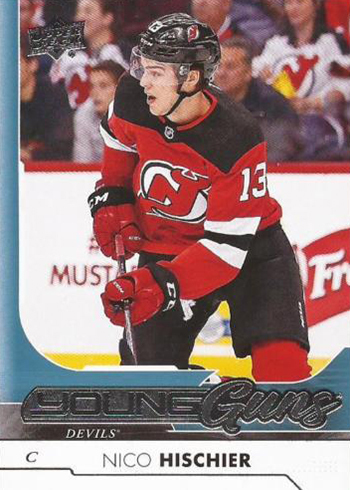 Additional base parallels get in on the hits. 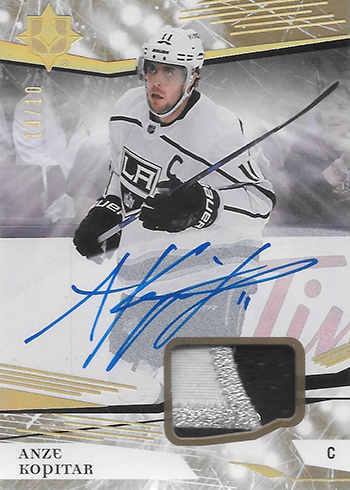 These include autographs, jersey (1:15 packs), and Patch Auto versions (/10) for select cards. 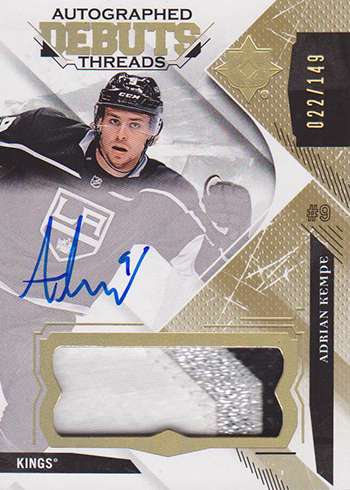 Onyx Black Autos are the rarest, coming in at one-of-one. 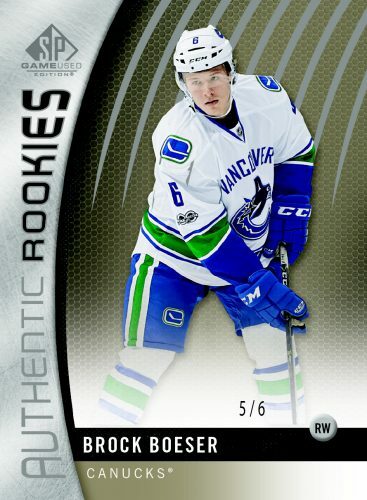 Ultimate Rookies Autographs land one per box. 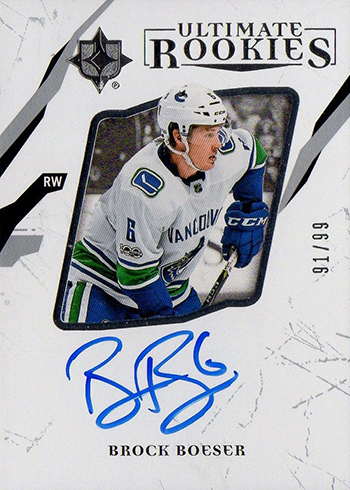 Featuring on-card signatures, these come in three tiers. The rarest, Tier 3, have 99 copies each. On the upper end, print runs are 399 copies (Tier 1). Tier 2 sit in the middle with print runs of 299 copies. 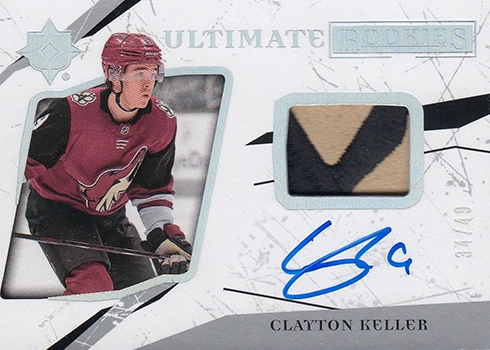 In addition to the autographs, select Ultimate Rookies have jersey (/299), patch (/49) and auto patch (/49) versions. Shield and Auto Shield Variations also return. Both are one-of-a-kind. 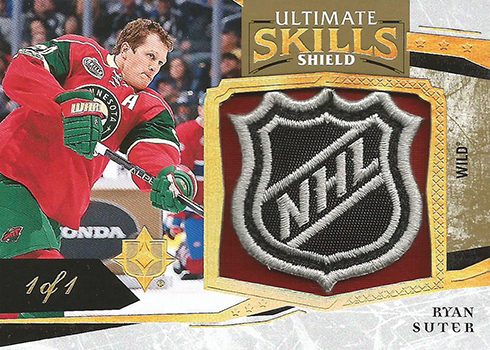 Rookie Shield Tandem cards might not have a signature but they do have a pair of NHL shield patches. Each has just two copies. 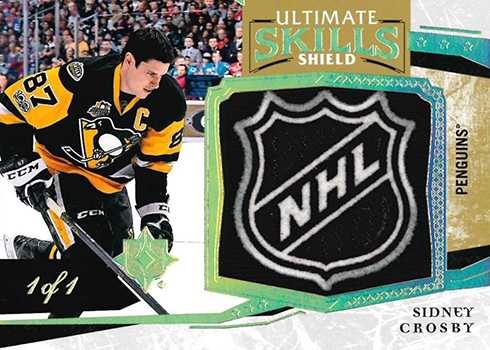 More one-of-one shield patches can be found in Shield Materials, Ultimate Skills Shields, 2017 Award Winning Shield, and Autograph Shield Materials. 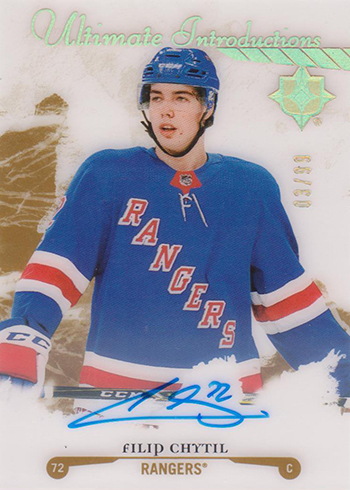 Taking it back a decade are 2007-08 Retro Rookies Autographs (Tier 1 – /299, Tier 2 – /199). 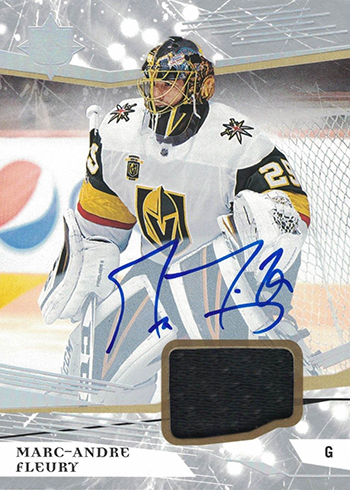 Autograph patch versions have 25 copies each while shields are one-of-a-kind. There are also non-autograph Tier 2 cards (/199), patches (/25) and shields (1/1). 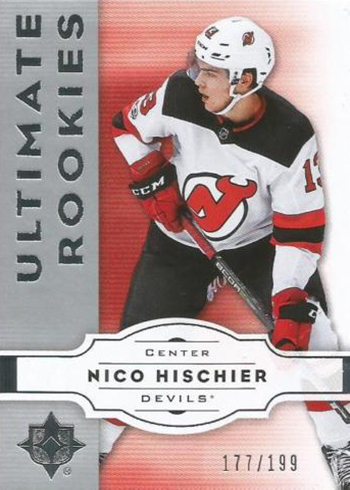 2007-08 Retro Debut Threads jersey cards come numbered to 99. 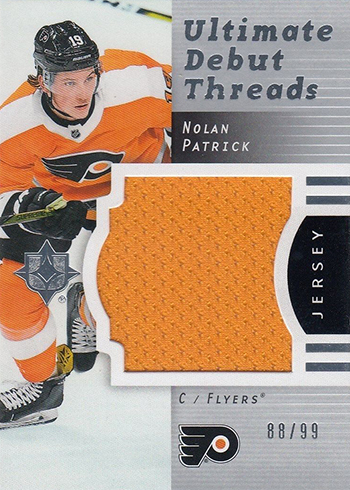 Autographed Debut Threads have oversized swatches and are numbered to either 49 or 149. 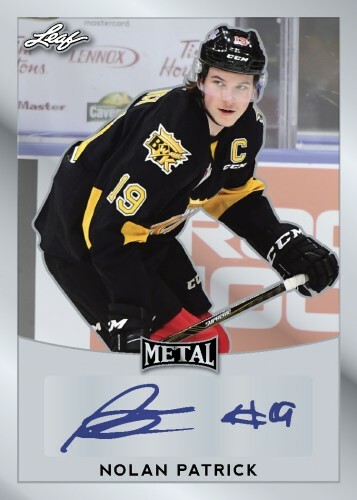 Unsigned cards have 49 copies. 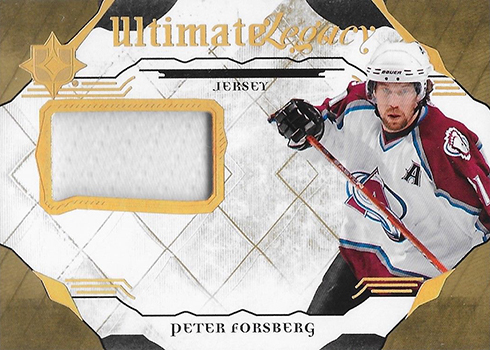 New to the product are Ultimate Legacy and Future Legacy jersey autographs numbered as low as 3 copies each for premium versions. 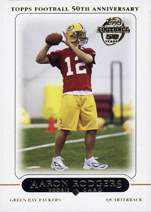 Basic Ultimate Legacy Jersey cards land 1:40 packs. 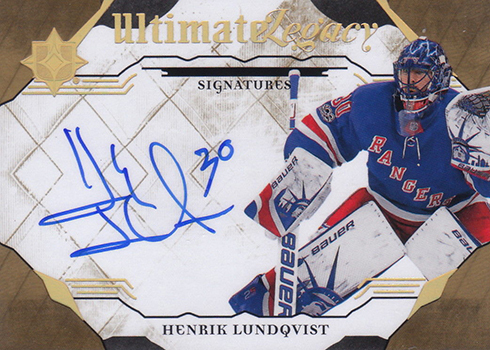 Ultimate Legacy Autographs fall at the same rate. 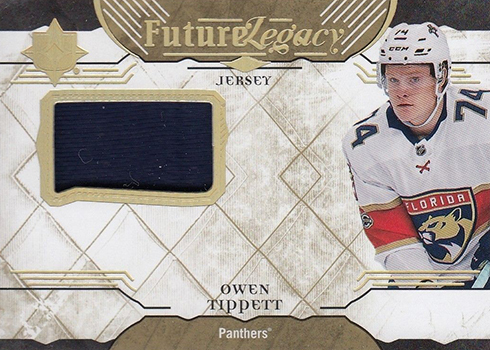 Future Legacy Jerseys are 1:15 packs and Future Legacy Autographs are 1:14. 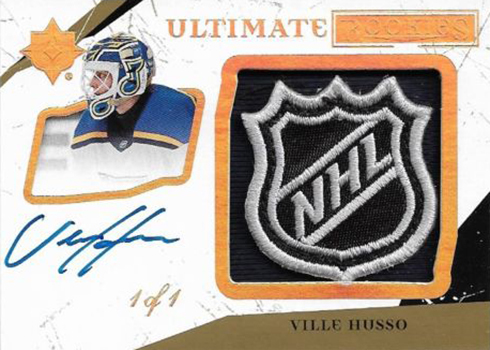 Ultimate Performers Jersey Autographs come numbered to varying amounts. 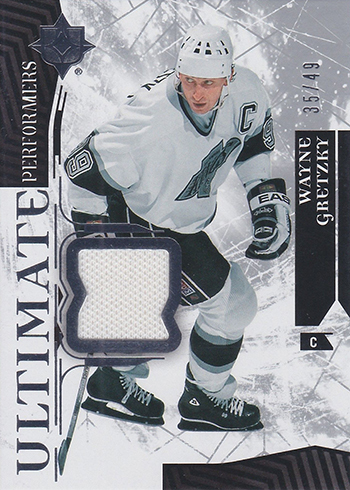 Other Ultimate Performers levels include unsigned patches, autographed patches, tags (/3) and autographed tags (1/1). 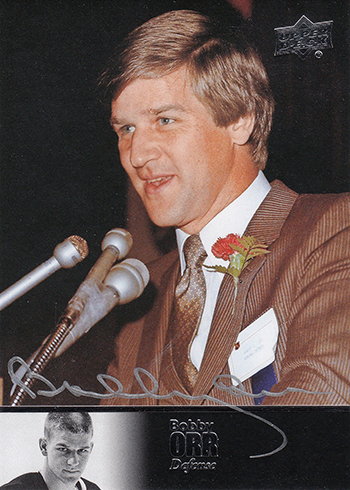 Signatures Laureates have 25 copies. Meanwhile Signature Material Laureates have two levels, numbered to 99 and 10. 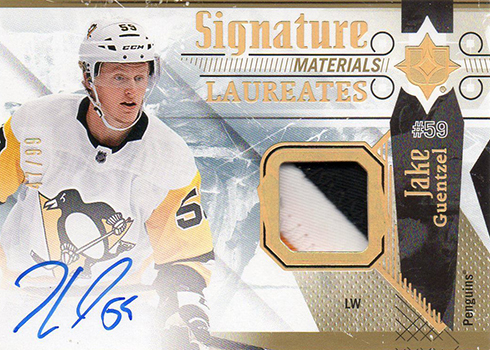 Similarly, Signature Material Phenoms have 15 and 65 copies. 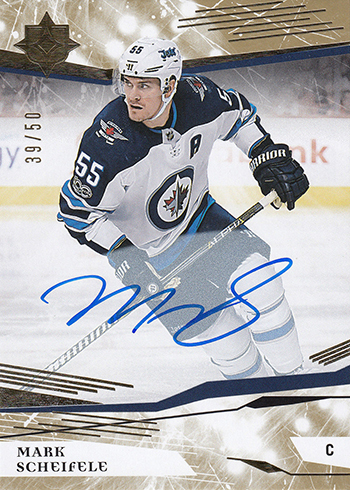 2017-18 Upper Deck Ultimate Collection Hockey sees the return of one of the card maker’s most iconic autograph designs. Ultimate Legends Hall of Fame offer a tweaked spin on the Legends set. 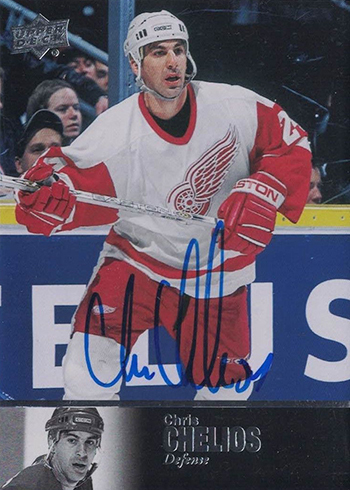 This time, it focuses on Hall of Fame moments. For many, redemptions can be a frustrating experience. 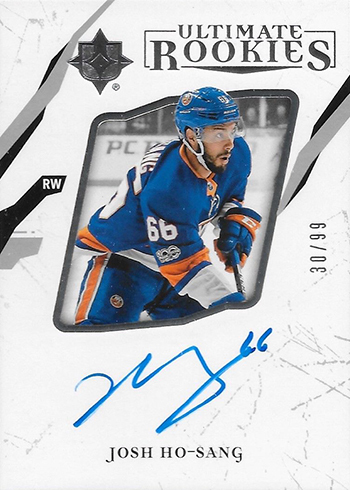 However, 2017-18 Upper Deck Ultimate Collection has one that’s required to give it a personal touch. 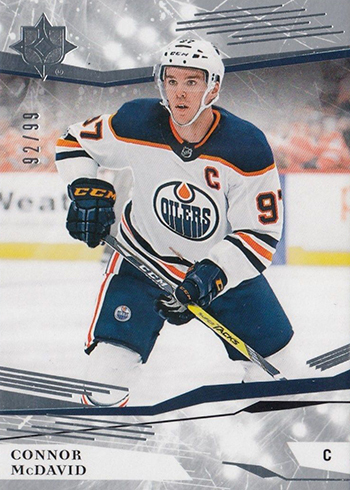 A small number of Connor McDavid Ultimate Inscriptions redemptions are available in packs. 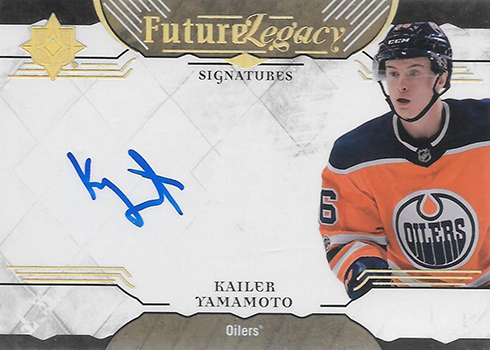 Not only does it give the collector an autograph from the Oilers captain but it comes with a personalized inscription. Ultimate Introductions offers another look at the season’s rookie class. The checklist is spread across four levels, making some more common than others. Tier 1 cards are 1:3 packs. Moving down the scale are Tier 2 (1:6), Tier 3 (1:9) and, finally, Tier 4 (1:12). 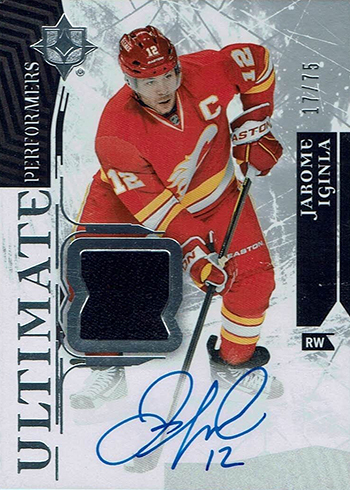 Parallels come in Onyx Black (/25) and Royal Red (/6). 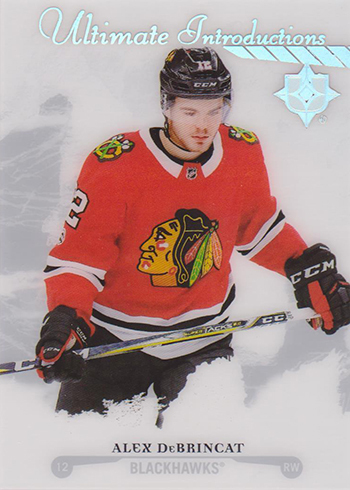 Distributed in packs as redemption. 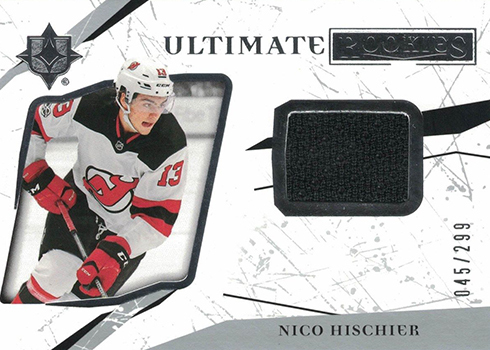 Want to know what cards your favorite team has in 2017-18 Upper Deck Ultimate Collection Hockey? Here’s the checklist broken down by team. Scroll through or click below to go directly to that team. Please note that Update cards from previous years are not included here. Please check the main checklist in the other tab for parallel specifics and insertion rates.